Eventually, people aren’t even going to know what a fruit or vegetable is. They’re only going to recognize pizza, chicken tenders and other fast food like substances. It’s already happening. I watched “Food Nation” in the spring and none of the kids in a school knew what a pea was. Scary. In the same way that vegetarians market their yucky tofu to make them look like appetizing meat dishes, the vegetable and fruit markets are going to have to dress up their presentation. 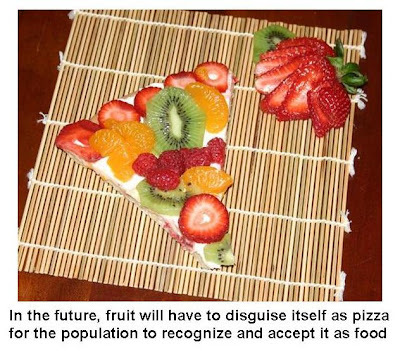 You know, make a pizza out of fruits. Shape and cook potatoes to look like chicken nuggets. I know, it’s ridiculous but it’s becoming reality. Vegetables and fruits are going to have to adapt now. They’re going to have to start the process to change their evolution and morph into something that looks appealing if they’re ever to hope to get eaten. We’ve been brainstorming for hours. We think we can fool those people that eat the sugary candy that just look like orange slices by dipping ourselves in small coconut particles. Oh, and our juice can be used to fool people into thinking they’re getting that orange Taco Bell taco grease instead of something healthy. We can cut our stalks into the shapes of lots of candy. Lifesavers, Skittles, M&Ms…you name it. Before the stupid sugar junkies know what hit them they’ll have their days supply of fiber and Vitamin K! Well, we’re brown and fuzzy and just the right size. We’re going to hang out with the cucumbers if you know what I mean! Ok…that wraps it up. Get out there and get eaten! That fruit pizza does look yummy. Do you have the recipe for it? I think fruit will do okay because you can always dip most of them into chocolate, and anything that goes with chocolate is always good. Just ask PC, she will tell you. Chocolate is the number one major food group. Kellogg's is ahead of ya on th' fruit pizza...( in your waffle section of the frozen foods aisle )...unfortunately, no one seems to be buying them...a harbinger of things to follow? Can't you get scurvy if you don't eat enough fruit? 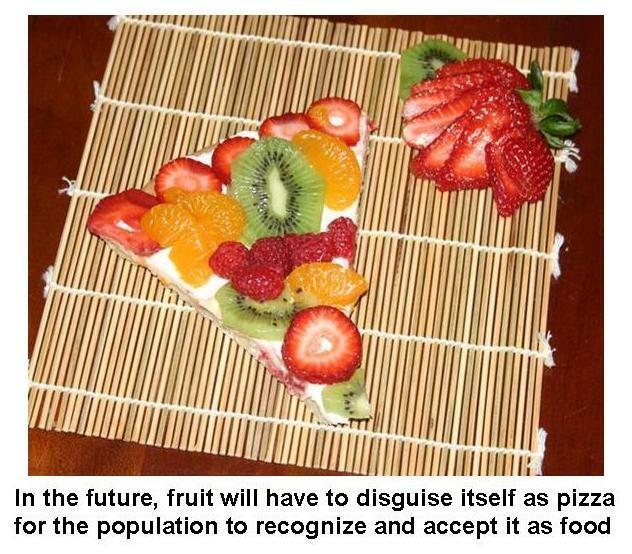 Hmmmm... Fruit pizza; that might have possibilities. I remember a pizza place here in Newport in the old days called Pit & Patio that used to have what they called the Hawaiian Pizza - ham and pineapple. It was great! Peas? Bleck. But you might get away with painting them different colours and calling them Skittles. Dunno. Just trying to help. What's next? Chocolate-covered brussel sprouts? So I just drank Taco Bell grease instead of OJ? Yummy. Today I'm glad I'm not American. As long as bacon doesn't go the way of the dinosaur, I'm happy. Reforminggeek – As a matter of fact, now that you’ve suggested them, yes! Incredible woody – Won’t feel as good coming out the other end of course! Perpetual chocoholic – I sometimes wish I wasn’t one either but then how would I ever be able to complain about Health care if I wasn’t from here? sharonheg - Bacon shall always be there for you...and you can dip it in chocolate too! Fruit pizza....it's called flan. My kids are typical. If it weren't for Hawaiian pizza, they'd get no fruit. Veggies? hahahahaha. Mmmmmm, orange Taco Bell grease! Why can't beer grow on trees? I could learn how to cultivate an orchard. Are you ready for this? My dad used to tell us peas would kill us. Because he loves peas and wanted them all to himself. I STILL don't like peas. I'm with Mrsupole on this one... the fruity pizza actually looks good. And any fruit dipped in dark chocolate is amazing! Although, I gotta say, I don't think the chocolate's gonna do much for the broccoli. Pizza Hut has something called a "Fruizza". I feel strangely drawn to it. Pull me back, toward the sausage and bacon and pepperoni. Monkey man – My kids won’t even eat that. I have managed to get them to eat a Caesar Salad now. Miracles happen every day! Megan – That’s very sneaky of you! Imagine what he hid in your food in return! subby - Now there's something to add to the "things that make no sense" list!